Procedural generation refers to the popular game design choice in which parts of the game are generated randomly from a set pool of objects to create a relatively unique experience for the player each time. This choice in design means the developers can give the players more in terms of replayability due to the allure of having different outcomes each time something is generated. And sometimes, that makes it hell to try to play anything else. The bizarre, nearly frightening dungeon-crawler/ bullet hell hybrid The Binding of Isaac is hard to stop. Both the original Binding of Isaac and its 2014 remake have altogether consumed far too much of my time. The games are great, but I feel as though I have spent far too much time on themas for as little as they have cost me. That may be the stupidest thing I have ever said. Isn't value something that is to be desired, especially at a time where a game that costs $69.99 (Thanks Canada) can be beaten in under 8 hours? You'd think so, I know I did. That's why I'm almost disgusted with myself over how much time I've spent playing Isaac. Between titles I've spent nearly 200 hours on a game that can be beat in about 20 minutes (as far as play time goes, that's hardly anything, as some YouTubers have gone on to make several hundreds of playthrough videos). As the devil is in the details though, the emphasis lies on can. Due to Isaac's semi-random nature, between the hundreds if not thousands of room, item, and enemy combinations, the game can be a walk in the park or a total nightmare depending on how lucky the player is. Each time the game is finished there is a likely chance that something else will be unlocked to maybe appear in subsequent playthroughs. And what fun is unlocking something if you can't use it? So you play it again and again until you do find it, and by then you've probably unlocked several other things that might show up in the future. It's a vicious, albeit entertaining cycle. The problem lies in when we get to stop playing. In most cases, a comfortable place to stop playing the game is at the end. But with Isaac's brief "arcadey" play time, you are meant to play through it dozens of times as a design choice. Unlocking everything will assuredly take a hundred times longer than one run, and unlike your average arcade experience it will be completely unlike your last run. Different combinations of characters and items begs for experimentation through countless attempts, and it's an easy thing to become addicted to. However, over the course of this time, how many other games have been released? Great games that should be played, games that you've probably bought, games that I've probably bought that aren't being played because we keep getting pulled in to this same loop of beating the same game over and over again? 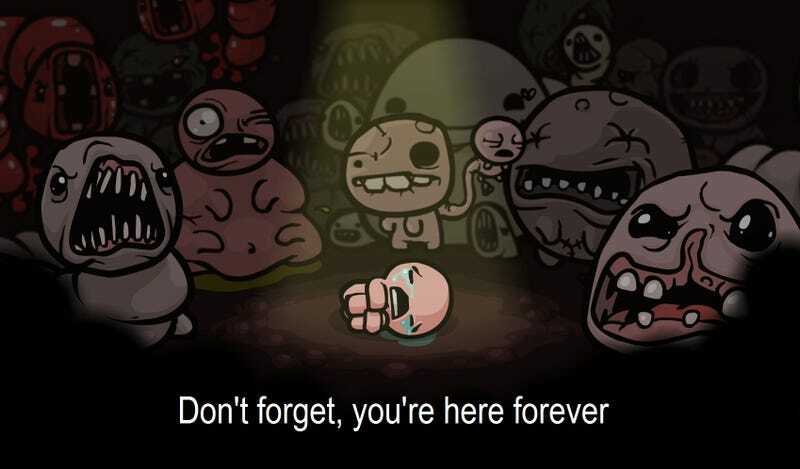 Even though Isaac makes a great point of respecting the player's time, how much of that time could be spent towards a new, unfamiliar experience? In my case, there are games ranging from role-playing to horror and everything between that I'm missing out on because I can't quit this one. Another game remarkably similar to The Binding of Isaac was an indie game released in late 2013 called Risk of Rain. Much like Isaac before it, it was a procedurally generated shoot 'em up (though side-scrolling as opposed to top-down) that I got hooked on in very much the same manner. Grab random power-ups, finish the level, a fairly familiar formula. However, a few months down the road, the developers released an update that allowed for the player to have some control over the items they acquired. That addition, as welcome as it was, made me feel like I could finally put the game down. Maybe what I need to finally quit Isaac is a little more control, over both the game and how I choose to spend my time.